Mustard and fat burning are often talked about together because the spicy condiment is believed to help give metabolism a boost. Is there any truth to the legend? There is some evidence that eating hot and spicy foods can help boost your metabolism and allow you to burn more fat more quickly. According to Penn State University "very hot foods can increase metabolism up to twenty percent for thirty minutes after consumption." However, regular yellow mustard isn't going to do the trick. To increase metabolism, spicy or whole grain mustards are more likely to kick up your body's fat burning processes. Spicy mustard can be found in many grocery stores, and for the best kick you should look for varieties that are Mexican or Asian. These are spicier than the American "spicy" mustards and usually provide higher concentrations of mustard seeds to get you burning more fat. Mustard seeds are surprisingly full of nutrition for something so small. They have a good amount of selenium, fiber, protein, phosphorus, manganese, magnesium, iron and calcium. They also contain just 30 calories in two teaspoons. When spices such as cayenne or chili peppers are added to mustard, as in traditional hot mustard (and many concoctions that can be purchased at your favorite hot sauce store), the capsaicin adds another fat burning punch. The chemical capsaicin, which is found in hot peppers, can help boost the metabolism, allowing you to burn even more calories. Cayenne pepper is often used in herbal remedies for weight loss, or some people who are trying to lose weight and cleanse their systems take a teaspoon or so of cayenne pepper daily to give their diet a boost. Although mustard seeds have been used as a natural remedy for centuries, there are few high quality human studies on the spice's efficacy, according to Dr. Andrew Weil's website. However, Weil indicates that animal studies show mustard seeds have properties that may help slow the growth of gastric cancer cells. A mustard poultice is believed to help soothe joints, relieve congestion and help respiratory problems. Mustard can be enjoyed as a condiment on sandwiches, mixed into homemade salad dressings, or used as a glaze on fish or chicken. 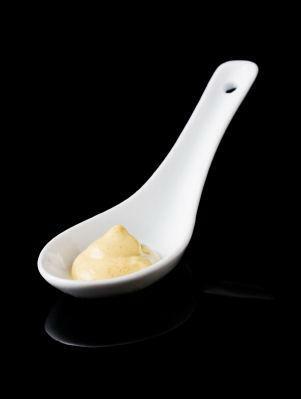 Mustard sauces are good to eat alongside meat (think fancy sausages instead of hot dogs) or even as a vegetable dip. Mustard seeds are a wonderful addition to cuisine from all over the world. A teaspoon or two of toasted mustard seed adds spice and depth to curries, bean dishes, and spice rubs for meat. Just toast the seeds in a dry pan on medium heat for a couple of minutes, until you smell mustard and the seeds start to pop, before using them. You can also grind whole mustard seeds to use in cooking, or try your hand at making your own mustard. Remember to add some cayenne or hot peppers to give your mustard a one-two fat burning punch. Eating mustard alone is not going to make you reach your weight loss goals. But adding mustard to a diet that is already full of healthy, low calorie and low fat foods can give your systems an extra fat burning boost. Keep in mind that spicy foods can aggravate some stomach conditions such as acid reflux, GERD, gastritis or ulcers. If you have these, please consult your doctor before consuming spicy mustard.